Since years, wstrt supports the adding of CTGP sections if using option --add-ctcode. But the current CTCODE doesn't include the Lap & Speed Modifier to manipulate the number of laps and the basic speed. But there are cheat codes available. And so Leseratte and I devolped an extension to add cheat codes. The first plan was that the user adds a simple GCT file (encoded cheat code). But while developing it seemed to be better if the user can also add a code handler of his choice. With release of v1.43, GCT and GCH files are supported. 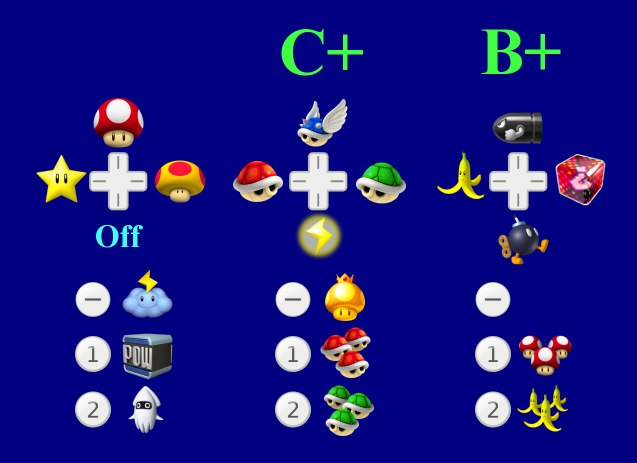 The advantage of an integrated cheat code section is that all users use the same cheat codes and don't need to enable their own Gecko code handlers. Option --add-section also accepts GCT files (Gecko cheat code files). There are many tools including USB loaders, that can create GCT files. If you want to add more than 1 GCT file, use the option multiple times, once for each file. Overall, 935 code lines are possible. But if moving the Gecko code handler and the codes to another memory location, more than 100000 code lines are possible. See section »Moving Gecko Codes« for details. As first step, the code lines of all GCT files are concatenated. At the final step, a section containing an internal copy of codehandleronly and the concatenated cheat codes is created. This section is inserted as TEXT section into the DOL file at address 0x80001800. If you want another code handler, use a GCH file instead (see next section). If the section is too large or will conflict to any other DOL section, a warning is printed and the new section is dropped. If option --force is set, the section is not dropped, but you may get an invalid DOL file. If option --verbose (short -v) is set, wstrt tells about the modifications. If set twice, a memory map of the new GCT section is printed too. A file header of 16 bytes. The Gecko Code Handler itself (e.g. codehandleronly.bin with 2728 bytes). start 0x04 u32 The start address of the section, usually 0x80001800. size 0x08 u32 The size of the code handler. The total size of the section can be larger. vbi entry 0x0c u32 NULL or the section address for the VBI interrupt. If not using the USB-Gecko, codehandleronly.bin is the best choice. In the download part you can find the file code-handler-section.bin. It is prefixed by a header and can be used as as base for own GCH files (see below). Any valid GCT file can be used. For example, USB-Loaders create GCT files. In the sections download part you find the file code-handler-section.bin. Load it! Create a GCT file with your cheat code. WCH is another file format accepted by option --add-section. The file format will be explained later. lap+speed-*.wch is the Lap & Speed Modifier for 3 regions. ls+icheat-*.wch is the Lap & Speed Modifier and an universal item cheat (see next section) for 2 regions. Normally, the gecko codehandler and the gecko codes are placed in the memory range of 0x80001800–0x80002fff. The space of 6 KB can be to small to hold all needed code lines. Option --gct-move adds a new text section to main.dol. This new section overlays the BSS section and is run at the very beginning. It changes the memory managment of the game and makes the heap smaller. Then it moves the gecko code lines to the new space. With this method more than 100000 gecko code lines are possible. Options --gct-addr and --gct-space are tuning options, but the later one is only needed for testing. If source is an original main.dol file of MKWii, then append 2 sections (usually T2 and D8) with CT-CODE. The CTCODE is inserted after sections defined by --add-section and then only, if there are no address collisions. If --ct-dir is used, then files named rmc[ejp]/boot_code.bin and boot_code.bin for T2, and rmc[ejp]/boot_data.bin and boot_data.bin for D8 are searched. Each option call adds the filename to an internal list. Each file must be of type GCT, GCH or WCH. All GCT files together are combined with an internal code handler to one section (like a GCH file). GCH and WCH define sections and patches. The defined sections are added and VBI hooks are optionally initialized. Use option --force to allow overlapped sections. Use option --verbose up to 2 times for a log. If a single file is not found and the filename (not path) contains at least 1 '@' character, then all '@' characters of it are replaced by the region code (one of P,E,J,K) for a second try. The intention of this option is to add a Gecko Code Handler and cheat codes to a main.dol for automatic execution. If a section is of type gecko code handler + cheat code, then make the heap smaller and move the cheat codes before the FST section. Parameter MODE is optional. If set, OFF disables and ON enables this feature. For mode AUTO (default) this feature is enabled, if the cheat codes are too large or for internal reasons. If --gct-move is active, a text section is created to manage the code handling. This section is only needed at start and is placed by default at address 0c802c0000 (good address for all 4 regions) as part of BSS. This option changes the start address of the section. If address is 0 or invalid, then unused BSS space is searched. Define the minimal space for the code part of --gct-move. This value is ignored, if it is smaller than the size of the cheat codes. This option was only implemented to test the memory allocation by --gct-move with large blocks.